If you know some children who love to climb, we have just the right playground set for them. 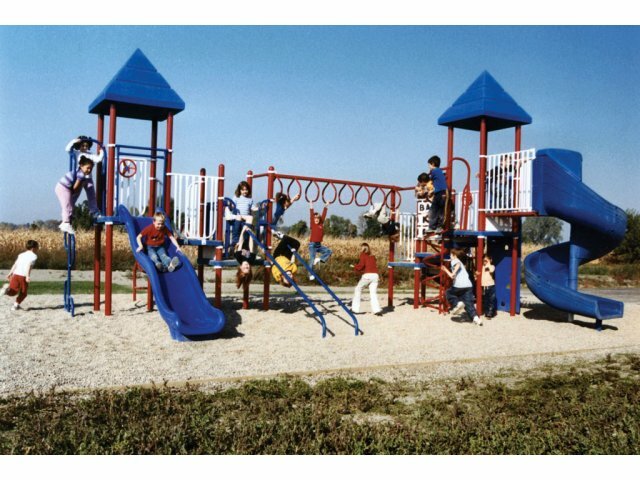 It includes enough climbing, swinging and sliding opportunities to keep your whole class busy throughout recess. With a Spiral Slide, Wave Slide, Snake Climber, Arch Climber, Coil Climber, Climbing Wall, Bannister Slide, and Tic Tac Toe Panel kids can have hours of active fun. With so much activity and use, this playground is designed to endure many years of student exploration. The rotation-molded platform deck system resists rust and erosion. This enticing playground equipment will get your students moving so they can get out all of their energy and return to class ready to learn. Fun Fitness: Includes a Spiral Slide, Wave Slide, Snake Climber, Arch Climber, Coil Climber, Climbing Wall, Bannister Slide and Tic Tac Toe Panel. Shady Play: A roof over the two main platforms keeps kids cool, even when it's sunny out.